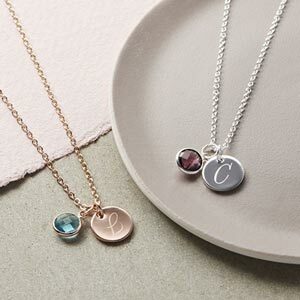 The Personalised Sterling Silver Family Birthstone necklace is a beautiful disc necklace with the birthstones and names added to represent each member of your family. The Birthstone disc necklace is a contemporary design handmade in pure sterling silver. You can also choose a rose gold vermeil finish to the sterling silver too for a soft pink gold finish. 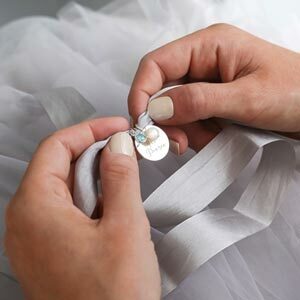 This stunning necklace can be engraved with up to 30 characters around its edge and is presented in a luxury ribbon gift box with a large selection of shimmering gift cards. 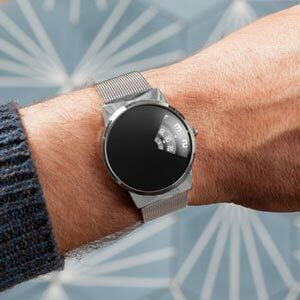 The perfect gift for the most special person in your life to cherish forever. Lovely necklace - such a great idea. My mother in law loved it! Lovely necklace. Arrived really quickly too. Love how it's personalised to me and my children. Chain is perfect length and disc size is spot on. Rose gold colour is really pretty.